A short account of a sit in at the Swedish health board by LGBT activists in 1979 which successfully pressured the government to remove the designation of homosexuality as a mental illness. It also sparked myths of a widespread "phoning in gay" protest. Homosexuality was legalised in Sweden in 1944, but in 1979 it was still classified as a mental disorder, despite years of campaigning and letter-writing. During Gay Liberation Week in August, 1979, the Swedish Federation for Lesbian, Gay, Bisexual and Transgender Rights (RFSL) decided to occupy the offices of the National Board of Health and Welfare, the government agency responsible for classifying diseases, to demand the change. 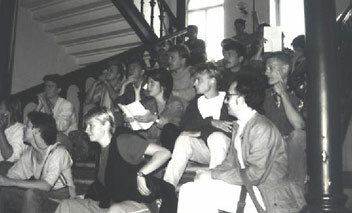 Up to 40 activists entered the building on August 29 in groups of two or three at a time so as not to arouse attention. They then gathered on the main stairwell and unfolded banners and began chanting. Police were called, but before any altercation began the protesters were met by the new director-general of Social Security, Barbro Westerholm, who indicated she agreed with protesters and was willing to help. Apparently, Westerholm met with resistance within the national board, but by 19 October, 1979, they agreed to change their diagnosis registry and remove homosexuality from their list of illnesses. Some of the occupiers took sick leave from their jobs to participate, and one woman managed to get sick pay for her time off on the basis that she was gay. However, the RFSL is keen to point out that this was only one individual, and the sick pay was so that she could attend the occupation, the "sick-out" itself was not the protest, despite many reports to the contrary including from the BBC.